My memories of Louisa White are as a young kid visiting her family's summer home some Sundays after Quaker Meeting in Providence, RI. 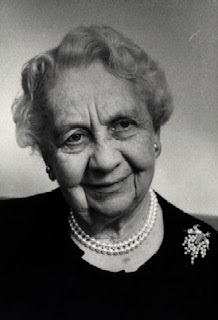 She was a contemporary of my grandparents, and must have been professor emerita by then. She encouraged my mother to consider nursing as a good career choice for a professional woman. The story, which an afternoon's internet searching cannot corroborate, is that as a young woman, she had gone to Teheran, Iran, and had set up a school of nursing there. It seemed an adventurous choice to me. In the mid 1940-s, having returned to the states, she started the College of Nursing at the University of Rhode Island in Kingston. My mom did graduate that program in the late 1950-s. The school's White Hall is named in her honor. Louisa White. Mentor, Science Educator, Quaker. A fence, or How I spent my summer vacation.. I replaced about 180 feet of a perimeter fence and entry gate this summer. I used a beautiful and inexpensive red cedar board, with many knots and color variations for visual interest. There's the stack of cedar fencing that I removed on the right. Still had some life in it, but it was gray, and some of the lower edges were rotting. The old cedar posts were mostly rotted, too, and the fence was beginning to blow back and forth in windstorms. The structure is cedar two by four-s fastened to 2 3/8 inch galvanized fenceposts. The cap is fabricated from two by six western red cedar stock. The top is pitched to shed water and it has grooves to slip over the top ends of the fence boards. I finished all surfaces prior to assembly with a Cabot penetrating oil stain, paying special attention to endgrain and to surfaces that would be in contact, potentially trapping moisture. It seems to be a really nice product, and cures to a protective film surface. I look forward to seeing how the fence and finish survive the coming years. And here's the gate... inviting. 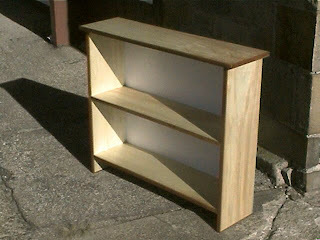 Well, another shelf unit completed.. this one is more recognisable as a shelf, more normal. Better than normal, since normal these days is particleboard with a picture of wood on the surface. You know the type of thing, purchaced in a little box, from a store in a big box, some assembly required. Particleboard has no structure, though, beyond the glue, and sags with use. If it gets wet, it dissolves completely.. The assembly is 36 inches wide, 30 inches tall, and about 10 inches deep. 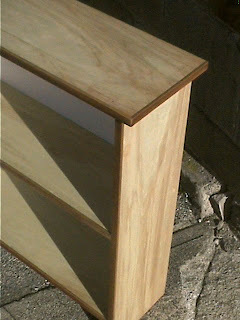 the shelves and top are assembled by glueing plywood splines in routed grooves. I used painted 1/8 inch plywood as a backing surface. Poplar plywood shelves are faced with meranti strips, glued and nailed. I used a strip on the bottom of the shelf as well, as a foot, for durability. The wood surfaces are sanded to 320 grit, finished with my workhorse finish, penetrating danish oil. Proportions? Eh, it looks like the top shelf could be a bit higher, so the lower shelf could have some taller items. Other than that, it feels pretty good to me. Any comments? and here's the 30 struts, and the.. er, "rescued" trash window blind that they came from.. all those little slats, begging to be used..
A friend gave me a store display from Patagonia, made of teak, that he saw on the side of the road on trash day. He knew right where to take it. I found it in the back of my truck later that day. It fit together in this interresting way! The uprights slip over a bridle joint in the base pieces. It's about 6 feet tall and 5 feet wide. Here is my prototype of the system, about 3 feet by 3 feet. It's made out of old scrap pine from a house trim replacement job, old doors, and an old oak futon frame. The shelves are a variety of widths just to experiment with form, utility, and proportion. The design really grabbed my interest. Next iteration will be made of hardwood and incorporate some changes suggested by folks who have seen it. This mock-up is made of trash wood, 100 year old trimwood, old fir doors, and a futon frame I found two days prior to getting this crazy idea! It, surprisingly, fit together kind of nicely after disassembly, too..
my downstairs neighbor who's a seamstress had a fabric piece from Italy that she wanted to display. The frame is about 2 1/2 feet by about 6 feet.